Omega Cure Extra Strength takes the guesswork out of the omega-3 experience. In every box, you receive a one-week supply of the world’s freshest, full-spectrum cod liver oil, measured into single-serve doses. Each vial delivers 3000 mg EPA/DHA and 1400 IUs of vitamin D3. Enjoy one vial every day with a meal. Results typically appear between 6-12 weeks of consistent daily use. 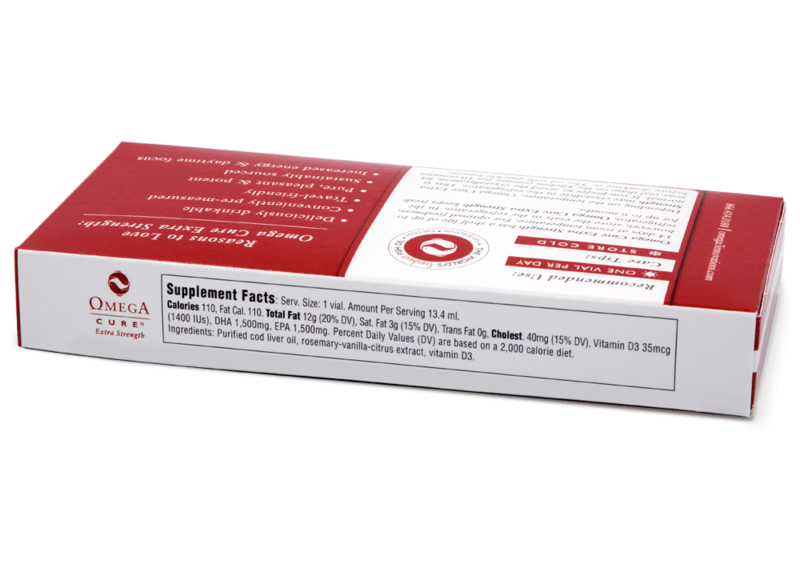 Omega Cure Extra Strength has a shelf life of 14 days at room temperature. For optimal freshness, however, store Omega Cure Extra Strength in the refrigerator. In the refrigerator, they keep fresh for up to 6 months. Depending on the temperature, Omega Cure Extra Strength may crystallize in the refrigerator. This is normal. If you prefer to avoid the crystallization, let your Omega Cure Extra Strength vial thaw on the kitchen counter for 10 minutes before drinking it. The oil will quickly liquify. Calories: 120. Ingredients: Purified cod liver oil, rosemary-vanilla-citrus extract, vitamin D3. The benefits of omega-3s have been widely publicized. Yet many people don’t feel a difference using typical omega-3 supplements. It could be because with most omega-3 products, you’d need to swallow 8-10 capsules daily to get an effective dose. We’ve made it easier. 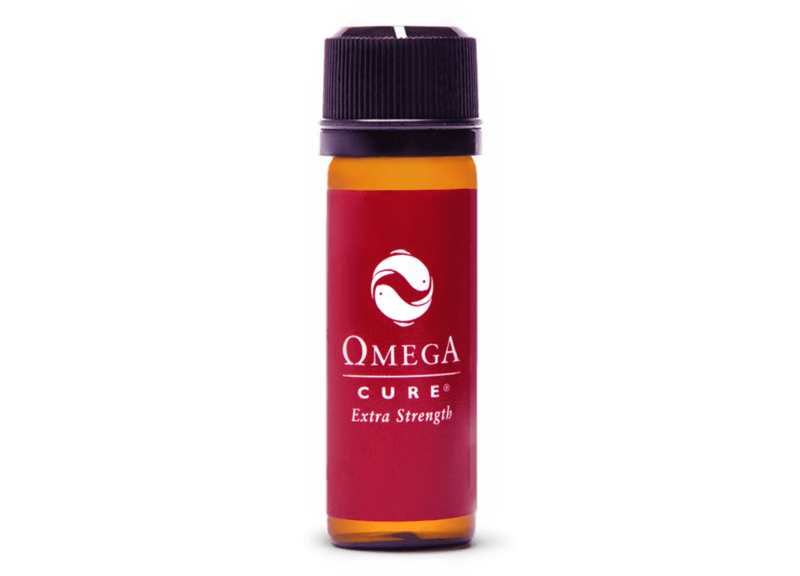 Each Omega Cure Extra Strength vial delivers 3000 mg of EPA/DHA in a liquid form that’s deliciously drinkable. Aside from omega-3, vitamin D is another commonly needed nutrient, known for its role in promoting bone health and supporting the immune system. For added convenience and potency, we’ve added 1400 IUs of vitamin D3 to each Omega Cure Extra Strength vial. It’s the perfect combination for people who want omega-3s and vitamin D without having to take multiple supplements. Here at Omega3 Innovations, we believe that freshness equals safety and increased potency. No other brand can rival our oil’s extremely low oxidation levels. For greater transparency, we mark every box of Omega Cure Extra Strength with the bottling date and freshness measurements of your batch. 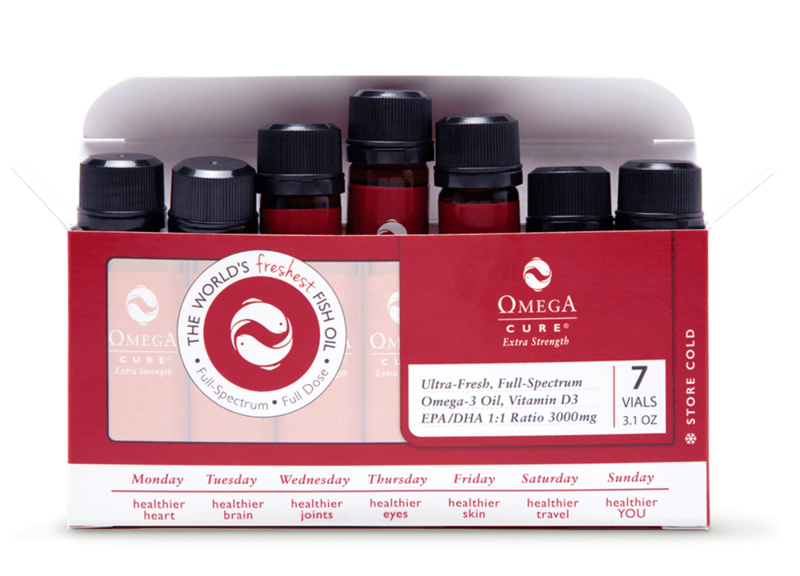 Omega Cure Extra Strength makes it easy to bring your favorite omega-3 oil with you on your journeys. TSA will allow you to pack up to 7 vials in your carry-on luggage. Or you can bring as many doses as you need in your checked bag. 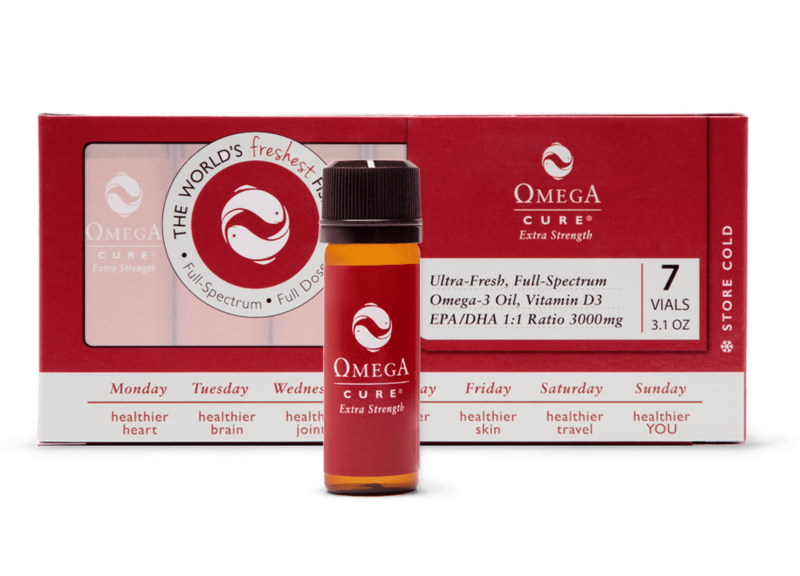 Omega Cure Extra Strength has a shelf life of 14 days at room temperature. OMG Omega Cure is amazing! Best quality fish oil out there! I took a vial every day for 30 days and noticed a difference in my complexion, AND I honestly looked forward to taking it every day because it was so delicious! Not fishy at all. I am a big fan! Highly recommend this product. I have gone through an experience- a major surgery- which not many probably can compare to. In January I had my jaw joints replaced along with 7 other procedures- they are custom built and all of this has plagued my life since age 11. I am now 34, with a new face that took 16 hours of surgery to remove previous screws and rebuild a new face with prosthetic joints to give me the ability to breathe, since I was only getting 4%air intake with my joints degenerated. I tried homeopathic remedies, was sadly taken advantage of by integrative medicine and the brands selected for me- without doing the research- trusting the investment in an integrative medicine Dr. This decision for a case as serious as mine did not end successfully, I was only getting worse by local Dr.s who were selling what may as well have been placebos.By chance, and desperation I discovered the Omega Cure- and am currently almost through my first month. I can say that I felt an immediate response, my healing process which is still long ways from being healed. I have lost feeling in the right side of my face, trigeminal neuralgia, I’m 34 and wanted to use yoga and supplements- but was told by my surgeon, specialists (and people who know that I would rather fight the pain on my own to not it further toxins in my body) That I just need to get through the early healing. After six months, this is still early healing, I cannot chew and have been on liquids- that is why omega Cure was so important, when not able to get proper nutrients through food, everything is liquid. My pain levels can cause serious swelling and it will take time -Yet the Omega Cure is a serious investment for me, since I am recovering from something so major, the surgery has away taken my ability to walk and I wear a titanium brace on my leg for ‘foot drop’ as well- since I had nerve damage from how I was placed on the surgical table for so many hours. I have tried so many brands of supplements, yet in just a few weeks I have started to feel slight pressure in my leg, which was completely numb- I feel more energized and positive and I can honestly say that the Omega Cure has lived up to its name and I’m hardly a month into it. Again, the investment has taken time to decide if this would be financially possible with all that has been invested to have this surgery. I even had to fly out of state because no surgeon in my state could take my case.I am pleased to say that I have started to heal faster, the swelling has decreased and I’m feeling more positive each day since I began taking Omega Cure along with my regime of other researched supplements. I have decided that this is the most authentic product on the market based on much research and some serious investments in supplement brands that I learned I could find the same ingredients cheaper.You cannot find a replacement product for Omega Cure. I hope that I can continue to take it and hopefully have the other half of my face ‘wake up’ to smile again. So far, this product has brought me the first real smile that I’ve had since this major surgery, back in January and before. People recovering from surgery should be starting this product immediately! Thank you Omega Cure! I should be a paid salesperson for Omega3 fish oil ! I have been using this oil religiously every day for two years . YES, it is the miracle cure for everything. My annual checkouts and blood work prove that this oil works. I have so many friends that I have convinced to take this oil , hence I should be a paid spokesperson for Omega3. Can’t say enough about this amazing product . Omega Cure Extra Strength is working on this 74 yr. old body. Cholesterol # has come down. I'm able to walk 40 mins. 4-5x's week with less knee/hip discomfort. Only occasionally, when I do strenuous gardening, do I need an ibuprofen for arthritis. I appreciate that I'm using a natural produce with so many health benefits. Over the past 20 years I have used various supplements to relieve my OsteoArthritis. Omega Cure Extra Strength has given me the best results. I have been taking the product in the morning for more than a year and find it helps my comfort and mobility. My A1C dropped by almost a full point after 8 weeks using Omega3 at night, before I go to bed. After trying many different types of medications, it is nice to find a natural one that makes such a great impact.